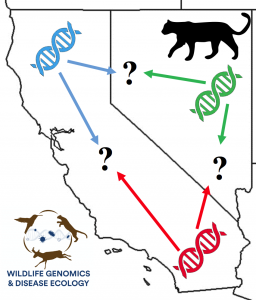 We are currently investigating which landscape components determine the population genetics of mountain lions among locations in California and Nevada. Animals interact with their environments from the cellular to the population level. In the Wildlife Genomics and Disease Ecology Lab, we are interested in what genetics can tell us about the health, size, and distribution of wildlife populations including those of mountain lions, pronghorn, bighorn sheep, deer, hummingbirds, and owls. Landscape components, such as mountains, forests, rivers, deserts, croplands, cities, and roads can all impact wildlife populations. As a result, we often study animal–environment relationships at the landscape level. In general, a “landscape” is an area of land consisting of multiple landscape components that change across locations. For instance, a mountain range may vary in elevation across the land, or a forest may vary in tree density. Because we combine the fields of population genetics and landscape ecology, we are called “landscape geneticists.” As mountain lion landscape geneticists, for example, we use genetics to understand how the landscape affects the abundances and distributions of mountain lion populations across broad spatial areas, such as states. Our research has important management implications for mountain lion conservation as well as implications for public safety.